Product code: ES7265 Categories: Sold Items, Sold Rings. Dating from the 1890’s comes this very beautiful and stylish antique opal and diamond cluster ring that looks spectacular on the finger and is destined to always be admired. Hand made in 18ct yellow gold, this ring is set with a lovely solid Australian white opal that measures 0.50 carats in weight. With lovely colours coming from the opal, it is highlighted by the twelve European cut diamonds surrounding the opal that all have a magnificent sparkle to them. These diamonds total 0.36 carats and really highlight and accentuate the gorgeous opal in the centre. Measuring 11.2mm in diameter, it leads to the delightful band which was made in a triple split design that adds even more charm and character to the ring and shows the detail that jewellers went to all those years ago. This is such a beautiful example of an antique opal and diamond cluster ring that has been looked after so well and is still in superb condition. Tag: Antique opal and diamond cluster ring. 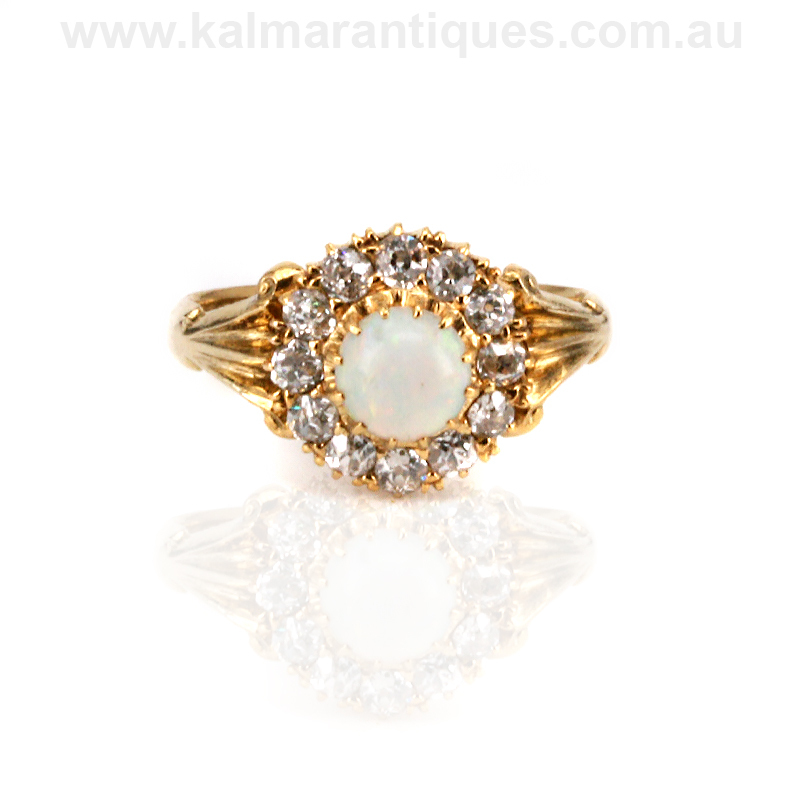 Antique opal and diamond cluster ring dating from the Victorian era of the 1890’s.